Location: From the intersection of Hwy 45 and County Hwy B east of Land O’Lakes, continue west on County Hwy B about .25 miles to a parking area on the northwest corner (behind the gas station). The first completed segment of this paved trail system includes the paved Land O’ Lakes Bike/ Pedestrian Trail, which is suitable for all types of non-motorized transportation except horses. Heading west from Hwy 45 through Land O’Lakes, the trail varies in width from 5 feet in the shopping area to 10 feet as it passes through beautiful forested areas. The trail connects and shares some of its length with low-volume town roads. 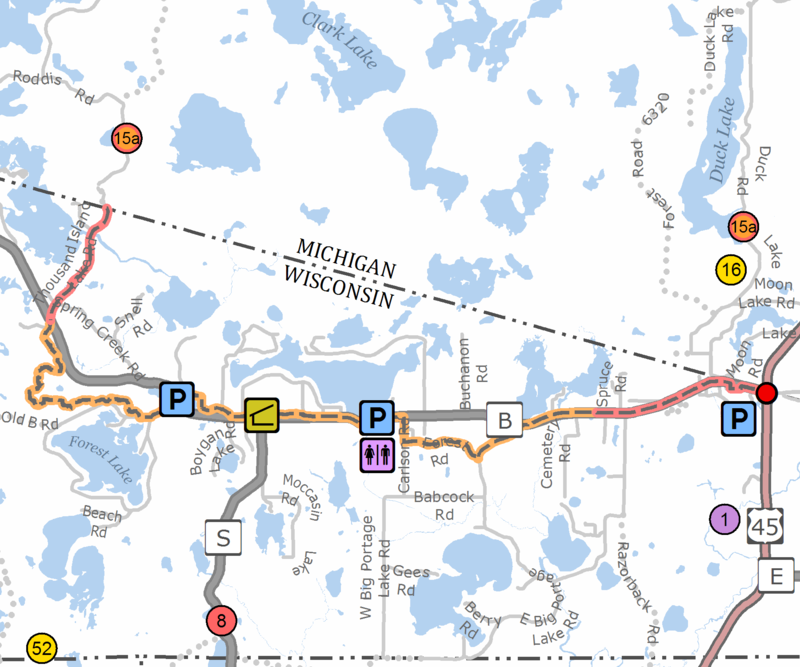 Future expansion of this trail east and north will provide a connection with the Agonikak Trail, a designated National Recreation Trail, which extends to the US Forest Service Visitor Center in Watersmeet, MI. For updated information on this trail system, check out wildernesslakestrails.org.